Where are you? Home > Reviews > AfroCubism - "AfroCubism"
AfroCubism is set to become yet another jewel in the crown of World Circuit. Fortune must have been smiling on Nick Gold when he got his surname - because it seems like everything he and World Circuit Records touch turns to gold. And there's no doubt that their latest release "AfroCubism" is set to become yet another jewel in the crown of World Circuit. This album drips quality: the compositions and entrancing arrangements, the level of musicianship, the sensitive recording (there's a reason why Jerry Boys gets handed the keys . . .) and the subtle mixing, right through to the Cubist presentation. Just the names of the principal players alone should be enough to get any world music fan salivating in expectation: 'el guajiro mayor' Eliades "Chan Chan" Ochoa & his Grupo Patria, the stunning, revolutionary ngoni (Malian Lute) player Bassekou Kouyate, Africa's finest electric guitarist and leader of the Super Rail Band Djelimady Tounkara, the world's foremost exponent of the kora (African Harp) Toumani Diabaté, veteran Griot singer Kasse Mady Diabaté, the outstanding Guinean balafon player Fode Lassana Diabaté and master tamani (Talking Drum) player Baba Sissoko. That lineup alone is enough to send shivers down your spine and send you running to the record store . . .
"AfroCubism brings together the cream of Mali with the coffee of Cuba." With a stellar line-up of already legendary international musicians from both Cuba and Mali you knew something very special was going to happen when they finally sat down in the Sonoland Studios in Spain (after 12 years waiting) and began to create "AfroCubism". But it all could have been so different . . .
Back in the Year 1 BBV (Before Buena Vista…) Gold set out to team up the Malians (Bassekou and Djelimady) with the Cubans (Eliades, Grupo Patria and - originally - the laud player Barbarito Torres). The studios were booked, the musicians primed, the passports applied for and the project set in motion. But as so often happens in the world of music, bureaucracy has a habit of wrapping up artistry in a straitjacket of red tape. The Malians' passports apparently got lost in the purgatory of the post for months and they couldn't make it to Cuba in time. World Circuit had to rethink their options and used the booked time to push ahead with another project involving Cubans (Juan de Marcos Gonzalez's AfroCuban AllStars). The time left over from this was utilised in recording a raft of retired, almost long-forgotten, Cuban veterans. The project became - out of nowhere - immense. It smashed records globally, shook the music industry with its unprecedented success, flew in the face of conventional wisdom and put world music (and Cuban musics in particular) into the consciousness of the mainstream audience through a combination of beautiful music, clever marketing, fortuitous timing, a romantic backstory and that touch of lucky gold that made it the zeitgeist of the 90s as we all stood between two worlds. It was, of course, the Buena Vista Social Club. Now, who knows what would have happened if the passports had made it through and the original concept had been recorded back then. Pure speculation. But here, finally, is 'the album that got away'. Except of course it's had to time to mature in the minds of the musicians and you just know this is going to be a cracking vintage. But don't just lay it down on the bodegas of your shelves. Crack it open and pour it out! “It was as though the musicians had been holding back their ideas and energy for that moment. After we’d waited so long, it all came together remarkably easily and spontaneously. The group had never played together before but the music just poured out and it continued to flow over the next few days." Seventeen songs were recorded in five days, with all the musicians playing together 'live' in one large room. A second session was convened some months later and produced a further nine songs. "AfroCubism" is every bit as good as anything World Circuit have ever released. Down to business: So many things excite me about this album that it's difficult to know where to begin . 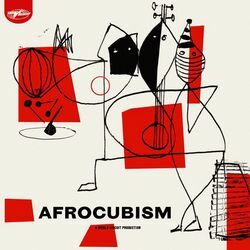 . .
"AfroCubism" is every bit as good as anything World Circuit have ever released - in my opinion it ranks way up there in the top five. As with everything from World Circuit it's that selection of ingredients, the lightness in the mix, that deftness of touch and economy of sounds that makes it a cut above the rest, so that you're left only with what needs to be there. When listening to the album at first you mentally segregate the tunes into 'Cuban' and 'Malian' either in origin or treatment - and there are some obvious choices for each camp ("Al Vaiven de Mi Carreta", "La Culebra", "A La Luna Yo Me Voy", etc for the former, "Karamo", "Jarabi", "Dakan", "Bensema", etc for the latter). But it soon becomes apparent that this way of thinking is totally irrelevant; the more you listen, the more it becomes seamless. These are not two distinct cultures but different points along the same line that slide along it at will. This is a truly glorious fusion between two proud, historic, immensely rich traditions and cultures. It's a meeting of equals in every sense. And this respect between master musicians can be felt throughout the album. Bassekou Kouyate remarks that: "Not just anyone could achieve what we have. I really believe in what we are doing here." 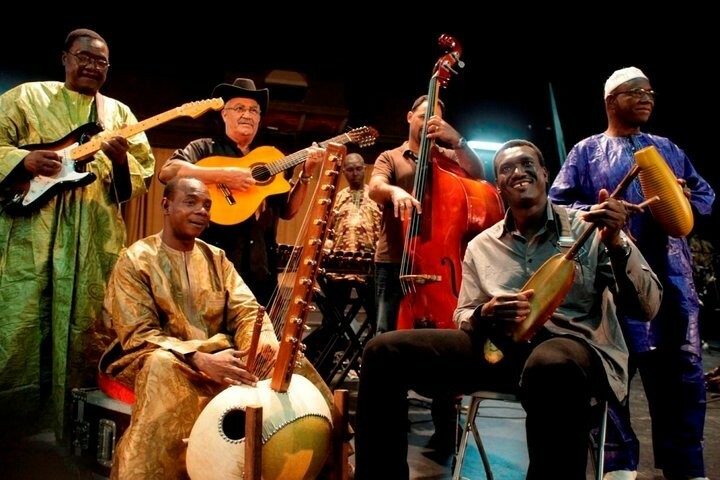 As Toumani Diabaté says: "Us Malians have played Cuban music, the Cubans have played Malian music also; and this has led to the creation of a new music". 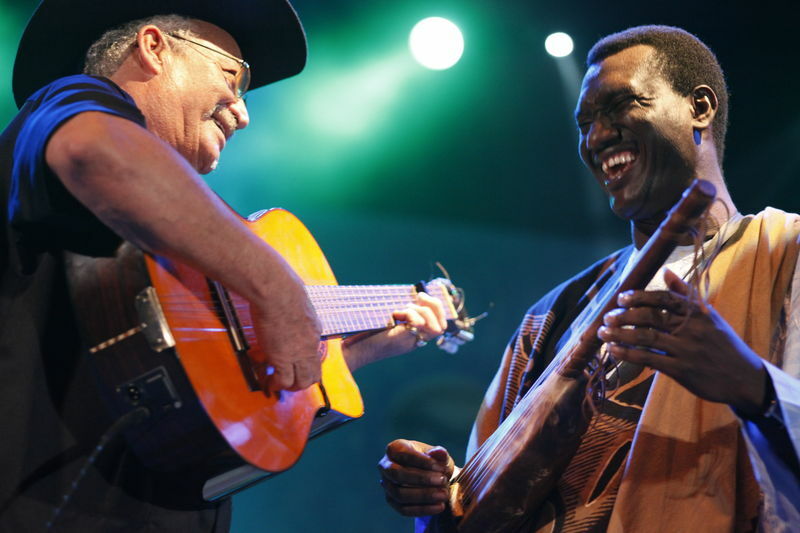 Eliades Ochoa adds: "For those accustomed to hearing the Cuban sound, then they hear the fusion with African music they will become aware of the beauty that is inherent in both." Where does Cuba begin and Mali end? At this point it seems worth mentioning the album's artwork (by Julian House at Intro) and also the group's (and the album's) name: AfroCubism. In the works of the great Cubist painters (and was it not Picasso's study of the great artworks of West African masks that led onto his Cubist paintings), bodies are physically deconstructed only to be reconstructed again, but with features moved around - at once strange but familiar, but also enervating and creative. So it is with AfroCubism's approach to their music. We are forced to look at the music itself from different angles and smile at the inventiveness of the musical conversations. Where does Cuba begin and Mali end? The track "Mariama" is a great example of this, starting life as an improvised piece in the studio from Eliades, then with Bassekou suggesting some traditional Malian lyrics ('Nobody knows their destiny, that's how the world is') and providing a fabulous groove on his bass ngoni, whilst Ochoa and the band knock out a funky changüi groove. A true 'malicubano' sound. Bassekou's "Karamo" (The Hunter) seems to reference "El Manisero" and Djelimady's "Nima Diyala" seems to do the same for the humorous "Yo No Baila Con Juana". The opening track "Mali Cuba" sets the scene with the reassuring sound and gait of a guajira but with the seeming unusualness of an African balafon soloing almost straightaway, followed by Eliades's guitar and Toumani's kora trading stories. Djelimady's electric guitar is to be heard surfing 'off the coast' behind and the trumpets (Alain A. Dragoni & Lennis Lara) come in right at the end to lead us back into los campos de Cuba. The next track, the seminal "Al Vaivén de mi Carreta" has a long history with both World Circuit and Ochoa himself (via Nico Saquito's "Goodbye Mr Cat"). Traditionally it sums up the whole Cuban rural experience and we're still in safe rhythmic and melodic territory, yet somehow it is transformed by both the tempo - luxuriantly slow and stately - and the addition of Kasse Mady's sublime voice and lyrics (alternating with Ochoa's), alongside the scintillating kora, the pulsating balafon and the truly magical sound that Djelimady gets out of his guitar. Once the coro enters with the deep harmonic "Cuando llegaré" and is then matched with the answering contra-coro I'm in afrocubic heaven! My favourite tune (after only listening to the album about seven times in a row…) has to be "Jarabi" by Toumani Diabaté. The beguilingly hypnotic rhythm spearheaded by Lassana Diabaté's balafon is truly infectious and the way it sits within the strings adds to the intensity. Floating effortlessly over the top are the timeless vocals, Toumani's rippling kora and Djelimady's otherworldly sound on the electric guitar . . . But all the tracks are that good, exquisitely crafted by master musicians with love and care. Some albums are dominated by producers (to better or worse effect) but you get the feeling that this one is all about the music itself and the musicians. It's very much their album, their music, what you get when you assemble true geniuses and just leave them to converse through their instruments (check out the ending between kora and ngoni on "Karamo"). And what about the exciting electric guitar work of Djelimady Tounkara on "Djelimady Rumba" combined with Baba Sissoko's electrifying modulated runs on his talking drum; the furious balafon of Lassana Diabaté on "Nima Diyala" ('I beg you my sweetheart'); the playful ngoni playing of Bassekou Kouyate on "Karamo"; Eliades's resonant vocals and guitar on his own composition "A Luna Yo Me Voy" ('I'm going to the moon'); there's just so much to take on board. And that's without even mentioning yet the contribution of the members of Grupo Patria - fluid, comfortable, supportive but still tight as hell. Dragoni and Lara's oh-so-cuban trumpets. The mellifluous Cuban chorus singers (Luis Bargaza, Jesus Jesús & Bellow Dáz). Did I already mention Sissoko's amazing reverberating tamani fills exploding out of nowhere and then disappearing back into the other percussion that bubbles, slaps and pops underneath? And why on earth isn't the fabulous Malian female backing singer credited more? Her name's Fatoumata Diawara - a feted singer and actress in her own right. Check her out on "Mariama", "Jarabi" and "Bensema" - beautiful! This is a truly glorious fusion between two proud, historic, immensely rich traditions and cultures. It's a meeting of equals in every sense. "AfroCubism" might have been, for fourteen years, "the great world music album that-never-was" but now it's here and destined to be every bit as treasured as Buena Vista and all it's offspring. From Bamako to 'el barrio' this one's going to be pumping out the speakers for a long time to come. If you haven't done it already, clear a space ready on your CD shelf. "AfroCubism" is released on Monday 11th October 2010. Write it in your diary . . . and then watch out for the tour!